As we approach yet another crucial European summit, the bargaining is becoming more intense. While the Merkel quote of "I don't see total debt liability as long as I live" got the headlines, there is no doubt a lot of jockeying behind the scenes. Various proposals are being floated, including a package of "banking union, a fiscal union and further steps towards political union", and intense pressure is being put on the Germans to yield. The forecasts are all over the map. While the consensus is that Germany will have to eventually bend on the issue of eurobonds, though not necessarily at this summit, others like Ray Dalio (via Zero Hedge) say, "Don't count on it!" While I am not expecting the Germans to change the lines of their national anthem to Europa, Europa über alles, nor do I expect an admission of failure this summit. Most likely, we will see the typical European fudge, or an announcement of "we have a secret plan to have a plan." While I am mildly interested in the summit statement, I am much more interested in the market reaction. If I am right and we get a "we have a plan to have a plan" kind of announcement, will the market rally or sell off? Gauging the market to news gives me much more important clues as to whether the bulls or bears are in control of this market. First of all, you can often get an idea of the tone of a market by seeing how it reacts to events. Last weekend, when the pro-European factions won the Greek election, the market rallied on Monday but faded, which was bearish. On the other hand, when the FOMC disappointed markets on Wednesday with just an extension of Twist, stocks fell initially, rallied and deflated again on an intraday basis to end the day with a small loss. That was bullish. This kind of market action tells me that neither the bulls nor the bears appear to be in control. 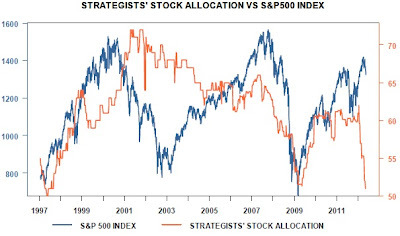 Despite Jeremy Grantham's comment that stocks aren't all that exciting, there may be upside room for equities based on a sector rotation trade. The AUDCAD cross rate is signaling a turnaround. The AUDCAD exchange rate is important because both the Australian and Canadian economies are similarly commodity sensitive, but Australia is more sensitive to the Chinese economy while Canada is more exposed to the US economy. Commodity prices, as represented by the CRB Index, is telling a similar story of stabilization. They aren't in a downtrend anymore and appear to be stabilizing at these levels. In a sign of a turnaround in Europe, even the Spanish stock market is turning up against the German one. Several months ago, I constructed a funds flow model based on this writeup on "measuring the skew of a multi-asset spread ratio of large cap equity returns vs liquid bond returns". In my own research, I describe a short-term trading model, whose time horizon is 3-4 days and not useful for anything but short-term trading, and a slow turnover long-term model that appears to measure long term institutional fund flows. I spent most of my career dealing with institutional investors like pension funds. Asset shift decisions tend to be made by committee and once they move, they move glacially but the shift is highly persistent. That model was in neutral and trending positive since early April and finally flash a buy signal last week. If institutions are shifting into equities, this will at the very least provide a floor on prices. When it is least expected, something might go right. All this suggests to me that the next 5% move in stocks is likely to be up because the bearish psychology is getting a little overdone, but the current backdrop does not suggest that this is an intermediate term bottom. Don't count on the next 10-15% move being to the upside. Significant risks remain. The American economy is showing signs of slowing (as an example, see Consumer Spending Probably Stalled in May). We are approaching Earnings Season and Street estimates continue to fall. Greece isn't out of the woods. Neither is China. Numerous macro events could jump up and bite investors. The picture I am seeing is a choppy sideways market. 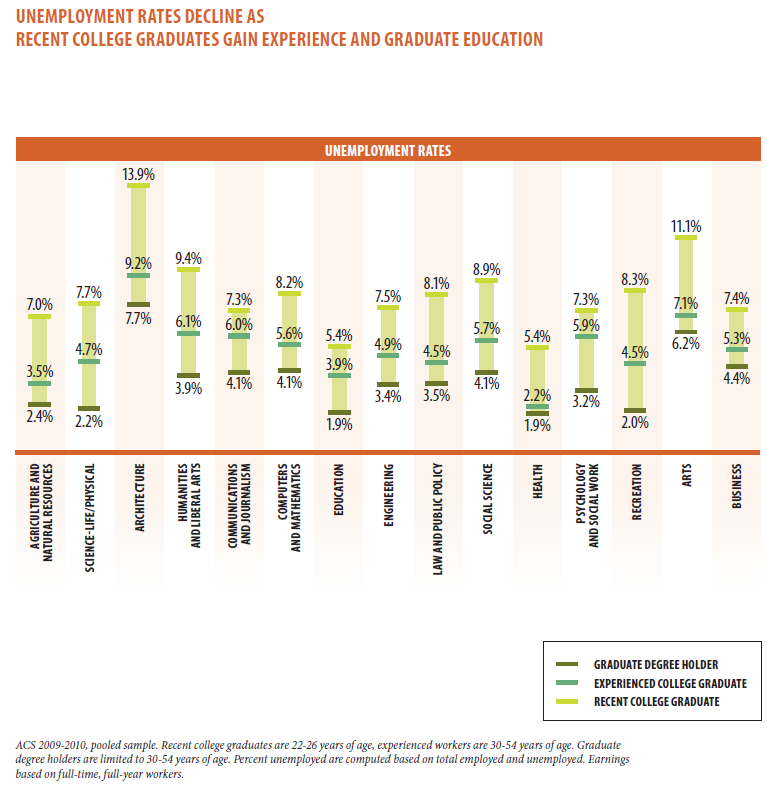 The best way to fix this inefficiency is to address the root of the problem: most bright students do not have any collateral and cannot easily pledge their future income. Yet the venture-capital industry has shown that the private sector can do a good job at financing new ventures with no collateral. So why can’t they finance bright students? This proposal is in the finest tradition of financial innovation on Wall Street, where product specialists try to securitize anything that's not nailed down in order to make a buck. What would you call the transaction where someone, rather than face a mountain of debt, sells all or part of himself to a holder of capital for a lump sum of cash? There are other ways of addressing the problem of student debt. When you have seniors retiring with student loans, there is no denying that there is an enormous problem with student loans and the cost of higher education. A better solution is to get the student to take some personal responsibility and make an adult decision about the value proposition in his own higher education. 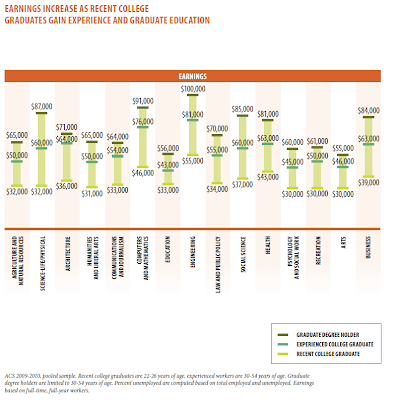 True enough, higher education still pays, but at what cost? 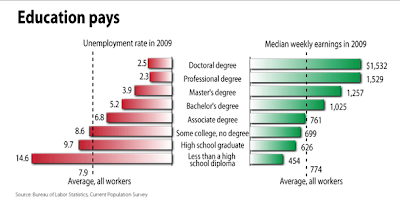 The Atlantic highlighted these issues in an article that showed the value of higher education. 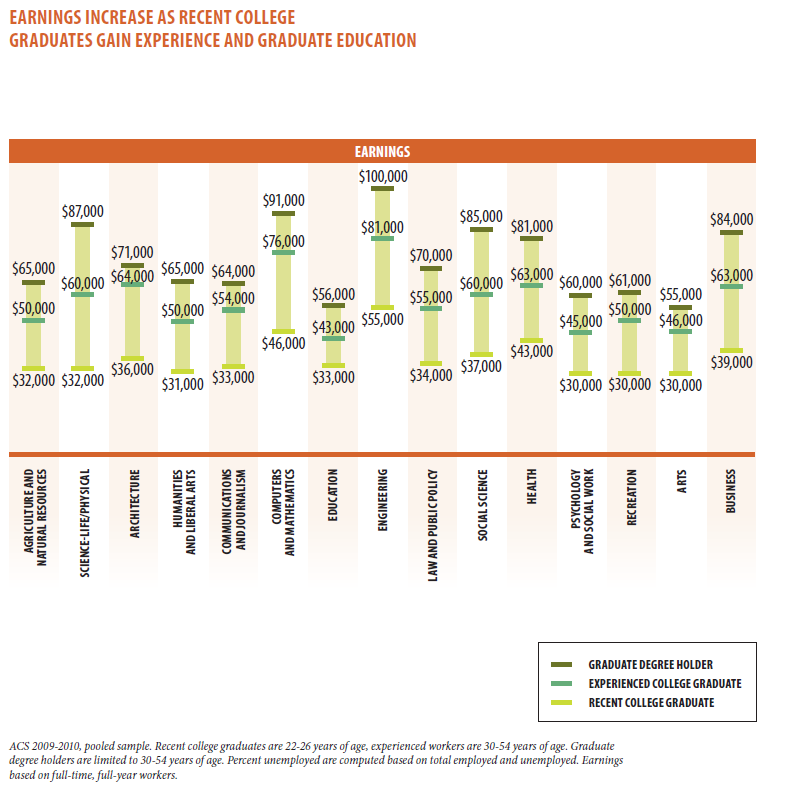 It's charts like the one below that prompt parents to push their kids into university at all costs. The dirty little secret is that not all higher education is the same. 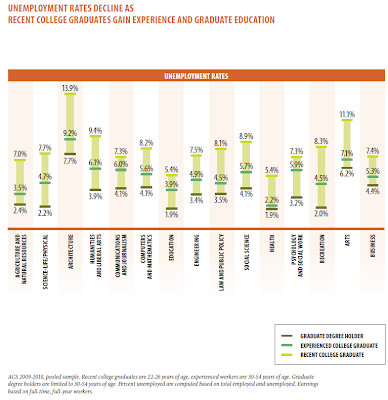 The Atlantic article pointed to a Georgetown study that showed the earnings and unemployment rates of different majors. The disparities are striking. So here's my message to students. Take personal responsibility for your own decisions about your life. If you want to specialize in Architecture, Journalism or the Liberal Arts because that's your passion, go for it! On the other hand, you need to manage your own expectations. If you graduate with a degree in Victorian literature or foreign affairs, don't complan when you get your dream job of working for an NGO that pays you 30K a years - because you made your own choice to go into the field of your own volition. There are tradeoffs in life and you made one. On the other hand, proposals like Zingales' to equitize people's earnings amount to slavery. It is so wrong at so many levels that I don't know where to even begin. How big a bazooka does the Fed need? Ben smiled and unveiled it with a flourish, "Let me show you my bazooka." Her eyes widened, "It's enormous!" She wrinkled her nose, "Are you sure it's going to do the job?" She stifled a smile, "Well, it's the thought that counts." Notwithstanding my bad writing (in the style of other parodies), questions remains ahead of the FOMC announcement. What will the Fed do? Will it be enough? Evidence suggests that the implementation of unconventional monetary policy during the recent financial crisis, via credit easing and asset purchases, succeeded in reducing credit spreads and yields, thereby providing further easing of financial and monetary conditions and fostering aggregate demand. These policy measures are most effective when targeted to specific market failures, sufficiently large relative to the targeted market, and clearly communicated. The evidence must be treated with appropriate caution, since the evaluation of the effectiveness of unconventional monetary policy is subject to problems of identification. The ongoing fiscal retrenchment will affect the outlook and therefore the timing of the withdrawal of monetary stimulus. Central banks should account for the potential negative externalities of unconventional monetary policies, which are often neglected in the analysis of their effectivness. [T]he accumulated evidence suggests to us that we should be really thinking in terms of something like the stock or accumulated total of Fed purchases relative to the size of publicly held Treasury debt, as the passage from Kozicki and coauthors indicates. That calculation produces a Federal Reserve share of about 16 percent of publicly held Treasury securities for fiscal year 2011, which is up sharply from the 8–10 percent levels seen during the 2008–10 period but very similar to the share of Treasury securities held by the Federal Reserve during the years 2000 through 2007. "The U.S. Treasury intends to continue to gradually extend the average maturity of the securities it issues—a tactic that locks in borrowing costs but potentially dilutes the impact of a Federal Reserve policy intended to boost the economy." In such an environment, it is probably good to remember that standing pat with central bank asset purchases does not necessarily mean standing still with monetary policy. Monday's market reaction to the Greek election, where it more or less got what it wanted, is telling. The consensus seems to be for more Twist, but not much else (see one example here). Just keep this in mind as you assess the Fed's announcement Wednesday. We characterise empirically the financial cycle using two approaches: analysis of turning points and frequency-based filters. We identify the financial cycle with the medium-term component in the joint fluctuations of credit and property prices; equity prices do not fit this picture well. We show that financial cycle peaks are very closely associated with financial crises and that the length and amplitude of the financial cycle have increased markedly since the mid-1980s. We argue that this reflects, in particular, financial liberalisation and changes in monetary policy frameworks. So defined, the financial cycle is much longer than the traditional business cycle. Business cycle recessions are much deeper when they coincide with the contraction phase of the financial cycle. We also draw attention to the "unfinished recession" phenomenon: policy responses that fail to take into account the length of the financial cycle may help contain recessions in the short run but at the expense of larger recessions down the road. The financial cycle is turning down. Ray Dalio of Bridgewater explained the financial cycle using the Monopoly® game as an analogy in this note. If you understand the game of Monopoly®, you can pretty well understand credit and economic cycles. Early in the game of Monopoly®, people have a lot of cash and few hotels, and it pays to convert cash into hotels. Those who have more hotels make more money. Seeing this, people tend to convert as much cash as possible into property in order to profit from making other players give them cash. So as the game progresses, more hotels are acquired, which creates more need for cash (to pay the bills of landing on someone else’s property with lots of hotels on it) at the same time as many folks have run down their cash to buy hotels. When they are caught needing cash, they are forced to sell their hotels at discounted prices. So early in the game, “property is king” and later in the game, “cash is king.” Those who are best at playing the game understand how to hold the right mix of property and cash, as this right mix changes. Now, let’s imagine how this Monopoly® game would work if we changed the role of the bank so that it could make loans and take deposits. Players would then be able to borrow money to buy hotels and, rather than holding their cash idly, they would deposit it at the bank to earn interest, which would provide the bank with more money to lend. Let’s also imagine that players in this game could buy and sell properties from each other giving each other credit (i.e., promises to give money and at a later date). If Monopoly® were played this way, it would provide an almost perfect model for the way our economy operates. There would be more spending on hotels (that would be financed with promises to deliver money at a later date). The amount owed would quickly grow to multiples of the amount of money in existence, hotel prices would be higher, and the cash shortage for the debtors who hold hotels would become greater down the road. So, the cycles would become more pronounced. The bank and those who saved by depositing their money in it would also get into trouble when the inability to come up with needed cash. What happened with Lehman in 2008 and in Greece, Spain and the other eurozone peripheral countries today are symptoms of the downturn in the financial cycle. There is no doubt that the financial cycle has been turning down since 2008. What about the business cycle? It's turning down as well. Regular readers know that I use commodity prices as the "canaries in the coalmine" of global growth and inflationary expectations. Consider this chart of the negative divergence between US equities and commodities prices. The market is also telling a similar story of an economic slowdown. Here is the relative performance of the Morgan Stanley Cyclicals Index against the market. It's in a relative downtrend, indicating cyclical weakness. Globally, air cargo traffic represents an important real-time indicator of the strength of the global economy (h/t Macronomics). 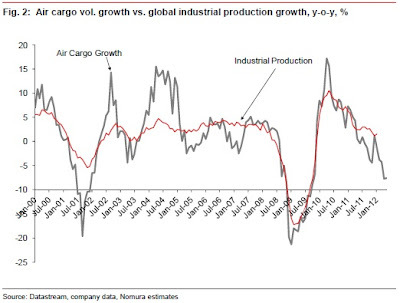 This chart from Nomura shows the correlation of air cargo growth with global industrial production growth. Air cargo growth is headed south as well. By our analysis, the U.S. economy is presently entering a recession. Not next year; not later this year; but now. We expect this to become increasingly evident in the coming months, but through a constant process of denial in which every deterioration is dismissed as transitory, and every positive outlier is celebrated as a resumption of growth. To a large extent, this downturn is a "boomerang" from the credit crisis we experienced several years ago. Regardless of the outcome of the Greek election, my inner investor tells me that the fundamentals of the economic outlook is negative. When the financial cycle and the business cycle both turning down in unison, that's bad news. As for how much of the negative news has been discounted by the markets, I don't know. What can change the trajectory of the outlook in the next few months is intervention, either by the central banks (which was rumored late last week), an announcement of more QE by the FOMC, or the news of some deal cooked up by the European governments, IMF, etc. My inner trader tells me that fundamentals don't matter and the markets will react to short term headline news. The Skyscraper Index is a concept put forward in January 1999 by Andrew Lawrence, research director at Dresdner Kleinwort Wasserstein, which showed that the world's tallest buildings have risen on the eve of economic downturns. Business cycles and skyscraper construction correlate in such a way that investment in skyscrapers peaks when cyclical growth is exhausted and the economy is ready for recession. Mark Thornton's Skyscraper Index Model successfully sent a signal of the Late-2000s financial crisis at the beginning of August 2007. Now comes the news that China plans to build the world's tallest building in just three months! It's a contrarian signal that indicates that an economy is topping out. Interestingly, the market peak and financial crisis that follow seems to occur sometime between the planning of the building and its completion. Consider, for example, the Empire State Building, which began in January 1930 - after the stock market crash. The Petronas Towers in Malaysia was completed in 1998, a year after the onset of the Asian Crisis. Here is more about the Skyscraper Index from Barclays (via The Big Picture). To be sure, a peak indicated by the Skyscraper Index doesn't mean that the lights have permanently gone out on the country which constructed the world's tallest building. The United States went on to continue its growth and assume the mantle of global leadership after the Great Depression. The Malaysian economy of today, or the economy of Asia, can't exactly be characterized today as a black hole either. For today's investor, I remain of the belief that, in terms of the effect on markets, China is at center stage and Europe is the sideshow (see Focus on China, not Europe). This latest signal from the Skyscraper Index confirms that view. If Europe were to stabilize itself but China lands hard, what happens in Greece or Spain won't matter very much. Central banks from major economies stand ready to stabilize financial markets and prevent a credit squeeze should the outcome of Greek elections on Sunday cause tumultuous trading, G20 officials told Reuters. I nearly fell off my chair! Did the G20 really say that ahead of the Greek elections this weekend? Apparently, the answer is yes. "The central banks are preparing for coordinated action to provide liquidity," said a senior G20 aide familiar with discussions among international financial diplomats. His statement was confirmed by several other G20 officials. In effect, the G20 just told the Greek population, "Don't worry about how you vote this weekend, the world won't fall apart whatever you do. Everything will be fine." Isn't that just encouragement for Greeks to vote for SYRIZA? The G20 just told them that any adverse consequences of a SYRIZA government won't be that serious and the fallout will be contained. Here's is what I worry about. While most sentiment models are indicating excessive bearishness, which is contrarian bullish, I am concerned that there hasn't been enough capitulation for the market to make an intermediate bottom. I have heard anecdotally that investment advisors are getting calls from their individual clients asking if it's time to buy. That's generally not a sign that sentiment has been washed out and not the sign of a capitulation bottom. In addition, the latest BoAML fund manager survey was encouraging and discouraging from a sentiment viewpoint. On one hand, fear is definitely rising, which is bullish. Fears of a global economic slowdown have come sharply back into focus, and expectations of decisive action by policy makers have grown, according to the BofA Merrill Lynch Survey of Fund Managers for June. A net 11 percent of the global panel believes that the global economy will deteriorate in the coming 12 months – the weakest reading since December 2011. Last month, a net 15 percent believed the economy would strengthen and the negative swing of 26 percentage points is the biggest since July-August 2011 as the sovereign crisis built. The outlook for corporate profits has suffered a similarly negative swing. A net 19 percent of the panel believes that corporate profits will fall in the coming 12 months. Last month, a net 1 percent predicted improving corporate profits. Investors have adopted aggressively “risk off” positions. Average cash balances are at their highest level since the depth of the credit crisis in January 2009 at 5.3 percent of portfolios, up from 4.7 percent in May. The Risk & Liquidity Composite Indicator fell to 30 points, versus an average of 40. Asset allocators have moved to a net underweight position in global equities and increased bond allocations. “Investors have taken extreme ‘risk off’ positions and equities are oversold, but we have yet to see full capitulation. Low allocations in Europe are in line with perceptions of growing risk levels in the eurozone,” said Gary Baker, head of European Equities strategy at BofA Merrill Lynch Global Research. What's more, central bank intervention is almost taken as a given. That begs the question, how big a bazooka will the Fed, ECB et all have to unveil this next round? “Hopes expressed last month of a policy response have now become expectations. Markets are keenly anticipating decisive action from key policy meetings in June,” said Michael Hartnett, chief Global Equity strategist at BofA Merrill Lynch Global Research. The Volume Intensity Model (VIM) has had a negative reading since 09 April, but last week accumulation (up volume or buying) rose while distribution (down volume or selling) declined, narrowing the spread between distribution and accumulation. Since VIM remains negative and VIGOR continues to decline, this mild improvement in the VIM only supports the case for a tactical rally. One concern is that distribution did not reach the “capitulation” readings near 80 seen in May 2010 and August 2011. The risk is that sellers are not yet completely exhausted and an adverse macro news event could trigger a future shakeout. Announcements like the one Thursday by the G20 are not helpful in the current environment for investors. They prevent the sentiment washout that is necessary for a new intermediate term bull market to start. All the G20 Put does is prolong this agony of choppy Summit-Advance the half/baked idea-Market selloff and Summit cycle again and again. Well, that market reaction to the Spanish banking bailout was underwhelming! I wrote last week that seeing a market's reaction to an event can be an important clue to future direction, as it is an indication of investor expectations and what news is priced in. We now know the path of least resistance for stocks is down. We got the first hint last week from the lukewarm market reaction to the ECB announcement and Draghi press conference; and later the reaction to the Bernanke testimony (see my comment Is the QE glass half full or empty?). The current open interest configuration on the SPDR S+P 500 ETF (SPY - 133.10) is very put-heavy, setting up the potential for short-covering related to the expiring put open interest at strikes immediately below the current SPY price. The odds are in the bulls' favor, absent a negative outcome with respect to Spain over the weekend. That said, a poor start to the week spurred by ongoing euro-zone concerns could create the kind of delta-hedge selling that occurred last expiration month, when put strikes acted as "magnets" once the ball got rolling to the downside. As popular put strikes were violated one after another during expiration week, sellers of the puts may have been forced to short futures to keep a neutral position, creating a steady but sure stream of selling. The heavy put open interest strikes essentially act like "magnets," as one strike after another is taken out. Delta-hedging risk certainly grows during expiration week if the market gets off to a weak start, as it did last Monday, and there is heavy put open interest just below current prices. It's usually the big put strikes that act like magnets, so 128 (which corresponds to SPX 1,280) would be a possible support area. There's a smaller-probability risk of a move down to 125 (or SPX 1,250), which is the next strike with significant put open interest. On the upside, a move into heavy call strikes at 134 and 135 would be a possibility in the event of a short-covering rally. These areas correspond to SPX 1,340 and 1,350, respectively, which we cited above as potential chart resistance. Given Monday' market action, it is evident that the bears have the upper hand. Salamone's comments put some further context to the short-term downside that US equities face this week. As I write these words, markets are surging in the wake of the news of a bailout of Spanish banks. I had written before that the principal macro risk wasn't coming from Europe, but China (see Focus on China, not Europe). I had expected that the eurozone would lurch in a crisis to rescue to crisis cycle and the Spanish banking rescue is more of the same. Already, there is a chorus of voices of why the bailout won't work (see examples from Goldman Sachs, BoA and Bruce Krasting). For now, it doesn't matter as the markets have interpreted the move as a stay of execution - as the cycle of crisis and rescue continues. What is more ominous are the signs coming from China. First of all, the technical outlook has turned negative as the Shanghai Composite is in a wedge formation that has resolved itself bearishly. Next door in Hong Kong, the Hang Seng Index is in a downtrend, which confirms the bearish technical outlook for China. StarMine models suggest that it’s still too early to embark on any bargain-hunting expeditions in Asia, where stock prices have underperformed most other regions of the world. In China alone, stock prices are down 16% from their March highs, but the value created by that selloff comes with big risks attached. Now, a new analysis of the most recent data suggests that the picture doesn’t appear likely to change any time soon. The “Predicted Surprise” – for earnings – the percentage difference between StarMine’s SmartEstimate, which puts more weight on recent forecasts and top-ranked analysts, and the mean estimate of all analysts – for emerging Asian markets earnings as a whole, currently stands at -1.6%. Among all markets in the region, China’s Predicted Surprise is -2%, second only to that of Sri Lanka, which comes in with a -2.8% Predicted Surprise. However, we believe that a cut in the lending rate will only have limited impact in stimulating investment. We believe China is in a liquidity trap. With a low interest rate environment, further cuts in interest rates may not get much of an additional impact. Today’s problem in China is not about funding cost or bank liquidity, but demand for loans for real businesses. As companies in the real businesses struggle with surging costs, over-capacity, and weakened demand, the incentive to conduct real investments is low. It would take some structural changes to jump-start the momentum of investments in the private sector, instead of just through easing monetary policy. If the banking system gets into trouble, then we are not just looking at a hard landing scenario, defined as sub-par economic growth, but a crash landing, which I define as zero or even negative GDP growth. Ursa Minor romps in China? For now, the good news is that the risk of a crash landing appears to be off the table. I had written in my previous post that systemic risks in the Chinese shadow banking could result in a crash landing and speculated about the possibility of Chinese capital flight. Right now, none of the shares of these banks are falling in a way that suggests market fears of an uncontrolled implosion of the shadow banking system. But watch this space! Current conditions are suggestive of an attack by Ursa Minor, or a minor bear market, in China. Nevertheless, such a scenario is one that hasn't largely been discounted by the global financial markets. So watch out. Is the QE glass half-full or empty? How the market reacts to news can be an important clue of future direction. In my last post, I wrote that you shouldn't expect too much from the ECB or Fed this week. The European Central Bank certainly disappointed the bulls with their inaction, not only on interest rates, but on the prospects for "extraordinary measures". Now it's Ben Bernanke's turn. We already have a clue on what Bernanke will say from Jon Hilsenrath's WSJ article entitled Fed Considers More Action Amid New Recovery Doubts. Here is what I am watching for. Will the markets key on the comment that action is not likely in the June FOMC meeting? The Fed's next meeting, June 19 and 20, could be too soon for conclusive decisions. Fed policy makers have many unanswered questions and have had trouble forming a consensus in the past. Top Fed officials have said that they would support new measures if they became convinced the U.S. wasn't making progress on bringing down unemployment. 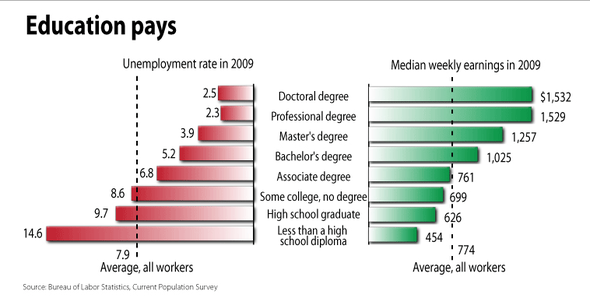 Recent disappointing employment reports have raised this possibility, but the data might be a temporary blip. Moreover, the Fed's options for more easing are sure to stir internal resistance at the central bank if they are considered. Or will the market key on the fact that the Fed is considering further quantitative easing [emphasis added]? Their options include doing nothing and continuing to assess the economic outlook—or more strongly signaling a willingness to act later if the outlook more clearly worsens. Fed policy makers could take a small precautionary measure, like extending for a short period its "Operation Twist" program—in which the Fed is selling short-term securities and using the proceeds to buy long-term securities. Or, policy makers could take bolder action such as launching another large round of bond purchases if they become convinced of a significant slowdown. Expectations for U.S. economic growth, while “pretty disappointing” at around 2.4%, is sufficient to keep the central bank from easing monetary policy, Federal Reserve Bank of New York President William Dudley said. “My view is that, if we continue to see improvement in the economy, in terms of using up the slack in available resources, then I think it’s hard to argue that we absolutely must do something more in terms of the monetary policy front,” Dudley said in an interview with CNBC, aired Thursday. Now that we know what Chairman Bernanke is likely to say, watch the market reaction. Is the QE glass half-full or half-empty? Time for the Draghi and Bernanke Puts? This week is an important week for investors who are watching for central bank action in the wake of market angst over Europe and the American economy. On Wednesday, the ECB will announce its interest rate decision and Mario Draghi will hold the customary press conference afterwards. On Thursday, Ben Bernanke will be testifying before Congress. He said it wasn’t his job to make up for the failures of policy makers. “It’s not our duty, it’s not in our mandate” to “fill the vacuum left by the lack of action by national governments on the fiscal front,” on “the structural front, and on the governance front,” he said. The ECB is likely to reduce interest rates in the face of economic weakness in the eurozone, but don't expect too much more. If Draghi were to reverse course from last week and announce some extraordinary measure like another round of LTRO, it would not only erode the ECB's credibility, but could paradoxically have a negative effect on the markets as it asks, "What looming disaster does the ECB know about that we aren't aware of?" Bottom Line: At this point, the direction of US data, the pathetic state of Europe, and the evolving slowdown across the rest of the world all point toward additional action by the Federal Reserve. Assuming this continues, it is an issue of timing and tools. My baseline is steady policy at the June meeting (depending, of course, on the usual financial turmoil disclaimer), with a possibility of an extension of Operation Twist. The latter option is something of a tough sell for me; it is cheap, but will prove to be ineffective. If the Fed needs to move, they need to reverse course back into quantitative easing. They need time to build internal support for such a move, which argues for action later in the summer or early fall, much as we have seen in the past two years. I just don't think they have enough to shift policy at this juncture. [P]ut yourself in Bernanke's head. His academic reputation was built on the study of central bank action during the Great Depression. This is probably a little voice in his head telling over and over again, "Don't let another Great Depression happen on your watch." As a result, we have the Bernanke Put. My guess is that investors looking for hints of another round of QE from the Fed on Thursday are likely to be disappointed. Weekends are a good time to think and reflect. After last week's carnage in the stock market, some thinking and reflection was more than overdue. The question I had was, "What is the market headed?" Sentiment models are screaming "buy"! Let's go through each of these one at a time. Martin T. over at Macronomics noted that Wall Street strategists are off the charts bearish, which is contrarian bullish. As well, US 10yr yields are trading 3 standard deviations from the 30+ year downtrend, which indicates a crowded long in the Treasury safe haven trade. Typically, when sentiment is this bearish, Value investors are all crawling out of the woodwork and shouting, "I can't believe that there are so many bargains!" While I have heard that comment directed at a number of European companies, i.e. these are real world-class companies trading at bargain prices (see one example at the FT article While all around ar panicking...buy), the same couldn't really be said of most markets. The Value investors just aren't there. Consider, for example, this Barron's interview with Jeremy Grantham, who is known to have a value bias, on February 25, 2012 when the SPX was about 1360, which is about 6% above Friday's close of 1278. We do a seven-year forecast every month. On a seven-year forecast, global equities outside the U.S. are boring. They've been so nervous the last year that they mostly reflect the right degree of fear about European problems. Emerging markets and developed markets outside the U.S. are within nickels and dimes of fair value. This is very unusual. We are in the asset-allocation business, and we like to see horrific roller coasters: It gives us something to get our teeth into. What could be more boring than global equity markets at fair value? About a quarter of the U.S. equity market—the high-quality, boring, great companies—is about fair price, too. The other three quarters are overpriced, and based on our numbers have a slight negative imputed return. While Grantham doesn't represent the final word in stock market valuation, he is a good bellwether for what Value investors think. As of the end of February, he believed that non-US equities were roughly at fair valuation. US equities are overpriced, with only a quarter, i.e. high quality stocks, at fair value. His comments were not a stunning endorsement for the stock market. IMPORTANT --- Dow Theory -- The D-J industrial Average recorded a high of 13,279.32 on May 1, 2012. This Dow high was not confirmed by the Transports. The two averages then turned down and broke below their April lows. This action confirmed that a primary bear market is in progress -- it was a textbook bear signal. Could you be a little more clear, Richard? Last week, I wrote that investors should focus on China, not Europe. The news out of China is headed south. The latest PMIs are signaling a global slowdown, not just in China but in Europe as well. I raised the issue of when investors might focus on the question of capital flight out of China, when Tim Duy picked up on the same story. Should the market start to price in the tail-risk of capital flight, look out below! Then we have the ugly US Non-Farm Payroll Friday. The only good news is that more data points of economic weakness will give the Fed political cover to act and unveil another round of QE. Despite what the central bankers say, don't forget that when things get bad enough, there will a policy response. As an example of the anticipated response, Mark Dow at Behavioral Macro believes that the IMF is putting on the face paint for a rescue of Spain. While the response may not fully solve the problem, it will kick the can down the road and spark a stock market rally. A repeat of 1998 in 2012? Putting it all together, what does it all mean? The market is supported by washed out investor sentiment, but not by valuation. The macro backdrop and momentum looks ugly. Is this the start of another cyclical bear? Probably not. Valuations don't look excessively stretched, but they aren't screaming "buy" either. Major bear markets generally don't start with these kinds of valuation metrics. 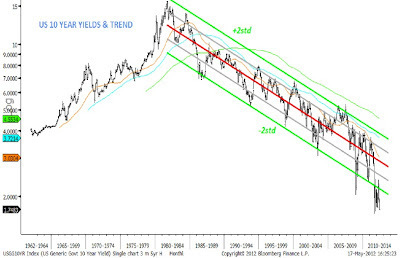 My best wild-eyed-guess is that we will see a major air pocket like 1997 (Asian Crisis) or 1998 (Russia/LTCM Crisis) in which some macro event sparks a major selloff, but turns around based on policy response. There are plenty of macro triggers out there. Greece, Spain, China, etc. Market analogues have limited uses, but look at the chart of the stock market in 1998. The market had an initial dislocation (Greece), stabilized and rallied (as we did a couple weeks ago) and started selling off again. At the nadir of the Russia Crisis that threatened to sink Long-Term Capital Management, the Fed came in and knocked some heads together to save the system. Now look at the chart of the market this year and last year. See any parallels? Don't misunderstand me. This is not a forecast that stocks are going to plunge this week. Analogues are analogies and they are imperfect. Markets are extremely oversold on a short-term basis and I don't think that we've actually seen the macro trigger for a waterfall decline yet, though there are lots of potential triggers. Nevertheless, were this scenario were to play out, it suggests that we haven't quite seen enough pain and we need one more capitulation down leg to equities. For now, my Asset Inflation-Deflation Trend Model remains at a deflation reading, indicating that the model portfolio should be primarily positioned in the US Treasury market. I will be primarily using that model and some short-term timing tools to try to spot the turn. Here is what I am watching. The chart below of the Euro STOXX 50 is falling, but not quite at the lows delineated by the 2009 and 2011 lows. Wait until the index approaches that zone and watch for signs of a "margin clerk" liquidation forced selling in the panic. Here in Canada, I am also watching the ratio of the junior TSX Venture Index to the more senior and established TSX Composite. While there is a lot of pain, utter and blind panic hasn't quite set in yet. When the blood starts to run in the streets, official intervention will be all but inevitable. At that time, that will be the opportunity to buy the pain in Spain.